My Bugsy is my first pug ,we got him on valentines day 2009he has a wonderful disposition and hes really tough to train ,i am hoping for some good advice from this forum! Again i have to say thank you to all the comments and suggestions,what a great site this is and all my new friends, I am keeping this short because i had foot surgery yesterday,so i can only be up for short periods of time ,just one thing , yesterday Bugsy scratched at the door to go out,i wasnt here but he did it ,hes now been fixed so hopefully as soon as i can walk we wil start the retraining,Again thanks for everything! Hi thanks so much your baby is also very adorable. It sounds like it's going better with Bugsy you will soon find out his habits they also do give signals when they need to go out my babies getting a little restless then I know it's time to go out it is still early days things will settle down you will soon get used to Bugsy and there is alot of advice here on this site we're all behind you stay positive. Hi thanks for the invite glad to see you have some help with the training. Your little baby has all the pug-itude all over his face he is a cutie you will see with alot of love and undertsanding he will be fine he looks very happy. OK, FIRST OF ALL, I TYPE A LOT IN CAPS SO PLEASE DO NOT BE OFFENDED. I AM NOT YELLING. WELL, THE BAD NEWS IS, HE SHOULD HAVE BEEN NUETERED BEFORE HE TURNED 5 MONTHS OLD (BETTER AT 4) AS HE HAS NOW DEVEOLOPED ALL OF HIS MALE "HORMONES AND TENDENCIES" A MALE PUG CAN ACTUALLY FATHER A LITTER AT THE AGE YOUR MALE IS RIGHT NOW. MARKING OF TERRITORY IS ONE OF THOSE TRAITS,, AND ALSO ACCOUNTS FOR THE WAY HE ACTED WHEN HE WAS WITH HIS PARENTS AND BROTHERS. THE GOOD NEWS IS, I THINK YOU STILL CAN MAKE A DIFFERENCE IN HIS TRAINING. FIXING HIM IS STILL A GOOD IDEA BUT NOT AS BENEFICIAL AS IT WOULD HAVE BEEN IF IT HAD BEEN DONE SOONER. IT IS THE ONE THING WITH A MALE PUP THAT I AM ADAMANT ABOUT TELLING MY NEW OWNERS. FIRST THING. AS A GENERAL RULE, PUGS DON'T LIKE THE TAXIS, AND HE MAY BE TRYING TO TELL YOU THIS. THEY ARE TOO ENCLOSED AND SECREGATES HIM TOO MUCH FROM HIS PEOPLE. THE WIRE CAGES ARE MUCH BETTER, WITH THE BONUS THAT YOU CAN SEE HIM BETTER ALSO.. THE SECOND FACTOR IN CRATE TRAINING IS IN TOO LARGE OR TOO SMALL A CRATE. IF IT IS TOO SMALL HE WILL BE CRAMPED AND FEEL PUNISHED, IF IT IS TOO BIG HE DOESN'T FEEL THAT NATURAL INSTINCT TO NOT POTTY WHERE HE SLEEPS. A WIRE CAGE ABOUT 24" WIDE BY 30" DEEP IS ABOUT RIGHT. A REGULAR SIZED BED PILLOW WITH A PRETTY CASE MAKES A GREAT "BED" INSIDE THE CAGE AND WATER AND FOOD DISHES THAT ATTACH TO THE SIDES ARE THE BEST. HE MAY BE "PUNISHING" YOU BECAUSE HE IS UNHAPPY IN HIS CAGE. HOW MUCH TIME DOES HE SPEND AT HOME WITHOUT SOMEONE THERE? DO YOU CAGE HIM WHEN YOU ARE GONE? YOU WILL PROBABLY HAVE TO START FROM SCRATCH WITH THE TRAINING. AS A BREEDER, I START WORKING WITH MY PUPS WHEN THEY ARE ABOUT 3-4 WEEKS OLD AND START TO CRY TO GET OUT OF THEIR BOX WHEN THEY HAVE TO POTTY. THIS IS THEIR NATURAL INSTINCT, AND BY TAKING ADVANTAGE OF IT AND STARTING THEM ON PAPER TRAINING AT THAT POINT, THEY ARE MUCH EASIER TO TRAIN LATER. IF THEY GET IN THE HABIT AT BETWEEN 4 WEEKS AND 8 WEEKS OF AGE OF BEING LEFT TO POTTY IN THIER KENNEL OR CRATE, THEY ARE MUCH HARDER TO TRAIN LATER. WHICH MIGHT BE THE CASE WITH YOUR GUY. YOU CAN DO IT, BUT IT WILL TAKE A LOT OF DEDICATION ON YOU AND YOUR FAMILIES PART. IT WILL BE WELL WORTH IT HOWEVER. DO YOU HAVE A FENCED YARD? DO YOU HAVE A DOGGY DOOR? IS THERE ANYONE HOME EVERY FEW HOURS OR DOES HE HAVE TO GO LONG HOURS BEFORE SOMEONE CAN TAKE OR LET HIM OUT? HE WILL NEED A REGULAR ROUTINE, WHICH MEANS YOUR FAMILY WILL NEED A REGULAR ROUTINE. HE WILL NEED TO GO OUT EVERY COUPLE OF HOURS ALL DAY LONG, JUST BEFORE BED AND FIRST THING IN THE MORNING EARLY, AND BE REWARDED EACH AND EVERY TIME HE POTTIES, WITH TONS OF LOVE, PETTING AND HUGS.. A FAVORITE TREAT CARRIED OUT SECRETLY IN YOUR POCKET AND GIVEN AS SOON AS HE DOES HIS JOB IS EVEN BETTER, AS LONG AS THE LOVE AND PRAISE ARE NOT FORGOTTEN TOO. HE NEEDS A "WORD" HE CAN ASSOCIATE WITH WHAT HE JUST DID. I RAISED KIDS, SO "GO POTTY" IS MY KEY PHRASE, BUT YOU CAN USE ANY WORD THAT YOU FEEL COMFORTABLE WITH AS LONG AS IT IS CONSISTANT. IF HE LIFTS HIS LEG AND DOES THAT JOB, PRAISE HIM, TREAT HIM, THEN REPEAT YOUR KEY WORD UNTIL HE DOES THE REST OF HIS BATHROOM DUTIES. OF COUSE HE IS NOT GOING TO NEED TO DO THAT PART EVERY TIME, BUT AT LEAST A COUPLE TIMES A DAY BE VERY ADAMANT THAT NO TREATS OR PRAISE WILL COME IF HE DOESN'T DO HIS PART! AT LEAST FOR A WHILE, KEEPING THE DOORS SHUT TO OTHER ROOMS, IF POSSIBLE IS THE BEST. THAT WAY YOU CAN KEEP A CLOSER EYE ON HIM FOR KEY SIGNS THAT HE IS LOOKING FOR A "PLACE". ALSO, WHEN HE IS IN HIS KENNEL, TALK TO HIM BEFORE YOU TAKE HIM OUT. THINGS LIKE... "NEED TO GO POTTY? ", "WANT TO GO OUT SIDE AND EARN A TREAT"?. TRY TO GET HIM EXCITED SO HE WILL MAKE SOUNDS, ANY SOUND. HAPPY SOUNDS, THAT HE WILL IN TURN START TO ASSOCIATE AND MAKE, WHEN HE NEEDS TO BE LET OUT OF THE KENNEL TO POTTY. HE WILL FOR A WHILE BE SPENDING MORE TIME IN THE KENNEL, SO MAKE THE MOST OF THE TIME RIGHT AFTER HE HAS DONE HIS "DUTIES" OUTSIDE. HOPEFULLY, SOMEONE CAN PLAY WITH HIM OR HOLD AND CUDDLE HIM AND LET HIM RUN AROUND THE HOUSE FOR A WHILE, BEFORE HE IS RETURNED TO THE KENNEL. KENNELING SHOULD BE USED WHENEVER YOU ARE GONE, OR CAN'T KEEP AN EYE ON HIM, BUT NOT IN PLACE OF THE REGULAR ROUTINE OF GOING OUTSIDE ON A REGULAR BASIS. AFTER A FEW WEEKS OF THIS HE SHOULD START TO DEVELOPE THE HABIT OF WAITNG FOR YOU TO TAKE HIM OUT AND EARN HIS TREATS. YOU WILL THEN BE ABLE TO MAKE LESS TRIPS OUT AND LENGTHEN THE TIME IN BETWEEN. I HOPE I AM MAKING SENSE OUT OF THIS. HERE IS MY EMAIL ADDRESS, CJBPUGS@MSN.COM. IF YOU WANT TO REALLY TALK, I WILL EMAIL YOU MY PHONE NUMBER, AND YOU CAN CALL ME. REBREAKING A PUG AT THIS AGE CAN BE VERY FRUSTRATING I KNOW. I HOPE I HAVE BEEN OF SOME HELP AND AM WILLING TO BOUNCE IDEAS BACK AND FORTH TIL YOU FIND SOMETHING THAT WORKS. 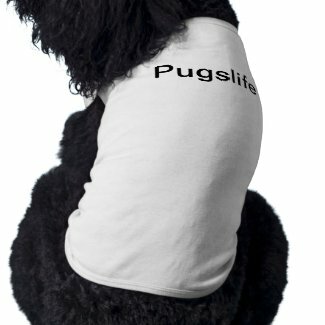 Welcome to Pugslife and to AZ Pug Lovers! My name is Cheri Bray(I am in the AZPL group as well). Take a quick look at my page and my profile then come back and finish reading my post. Has he been nuetered? If so at what age? How old was he when you got him? Had the breeder done any paper training or crate training before you got him? If you can answer these questions for me, I will make some suggestions and offer some advice. I am no expert, but I do have years of Experience. Hi chec out Denise Hutsonshe is canine behaviorist I'm sure she will be able to help also check out the forum on the top of your page TrainingTips on training and pug behavior. You have made a Fur-Perfect choice in a dog they really are amazing animals all will ok with a little patience they learn very quick. Your little Bugsy is just to adorable for words she will give you endless joy.